There really are plenty of both. First, the base S model starts at $13,990, with the mid-level S Plus listing at $15,240 and the tested red SV model, the top tier, beginning at $15,990. Those are all exceedingly modest prices in today’s market, for an equally modest model. The sedan starts even lower with a base price of $11,990 and features the same power train, with a five-speed manual transmission. That, in reality, might be the better way to go for putting the power down, but it gets slightly worse gas mileage than CVT-equipped models. Note comes in some bright, youthful colors. As you’d expect, this low power car that weighs just 2,482 lbs. is thrifty with gas. The EPA rates this model at 31 mpg city and 40 mpg highway. I got 31.9 mpg while the trip computer was estimating 35.2. I’ll admit to running mostly with the overdrive off in city traffic. That keeps the engine revs up and burns more fuel. In the sedan I tested more than a year ago I managed 32.5 mpg, and again the trip computer was much more optimistic. Ride was not nearly as capable as the sedan I had driven, and that surprised me. The Note still rides on a 102.4-inch wheelbase and uses an independent front suspension and stabilizer bar. This unit felt choppy on city streets. I’d call its ride stiff, but not in a good, sports car way. Steering was OK, with light steering effort and some play in the wheel. I felt the steering was fairly good until I swapped the Note for a new Ford Fiesta mid-week and the difference was stunning. 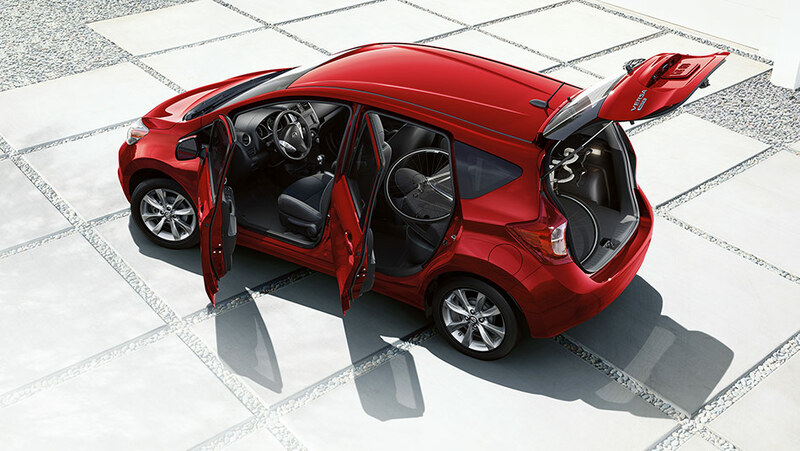 The Fiesta has much more responsive steering. There are vented disc brakes up front, but less costly drums in back, keeping costs down. However, there are traction and stability control. Note’s interior is low-rent feeling, as you’d expect, with a hard plastic dash and door trim. But I like its simple dash layout with logical easy-to-use controls. 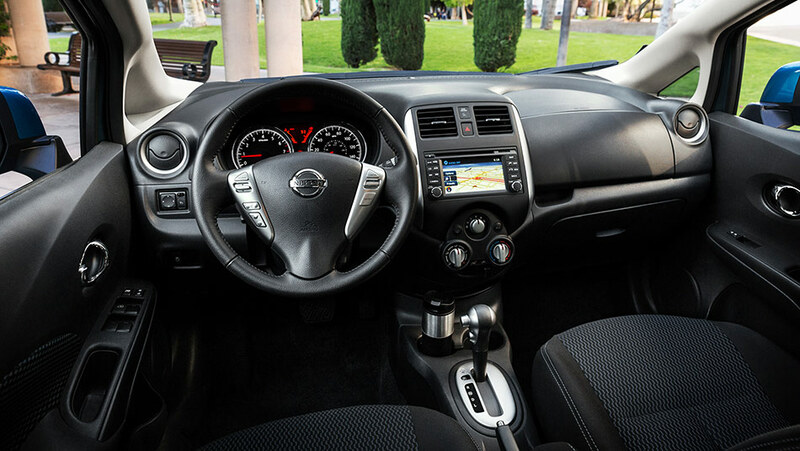 Nissan also gives the car a bit of spiff with a mild twin cockpit dash design and pewter-look trim on the steering wheel hub, center stack’s sides, along with some knobs and the shifter. Yet the door release handles are chromed, which seems inconsistent, but many car makers do this. The interior isn’t fancy, but simple and well laid out. The SV model features upgraded cloth bucket seats, which look fine, the test car having black seats with blue patterned cloth inserts. These are pretty firm, but were fine around town. I suspect they’d grow harder on a long trip. Support is good from the seat back as it is more contoured than the lower cushion. The SV also adds power windows and door locks, a leather steering wheel, Bluetooth, keyless entry and a 6-way manual driver’s seat. I like that the driver’s seat includes a pump handle so you can raise or lower its height. But the steering wheel will only tilt, not telescope. I found myself a bit closer to the wheel than I’d like, once the seat was adjusted for my short legs. Additionally I like the view from inside the Note. Its glassy cockpit gives a driver good visibility, somewhat comforting when you’re in a small car. While there is some engine whine, there’s not a lot of road or wind noise and fit and finish were good throughout. The simple dash puts a large tachometer and speedometer in front of the driver, and there’s a small button between them that allows you to adjust the trip computer. It’s easy to use, but a bit awkward to get at and really should only be used while the car is stationary. Mid-dash are two air vents with a navigation/radio screen below them. The test car added a technology package for $800 that included the nav system with voice recognition, plus NavTraffic and NavWeather so you can check them as you drive. Plus, in addition to a backup camera that’s part of an SL package ($1,700), the test tech package adds an Around View Monitor. This is right next to the backup camera and shows you what’s alongside the car, handy when backing out of a tight parking spot. 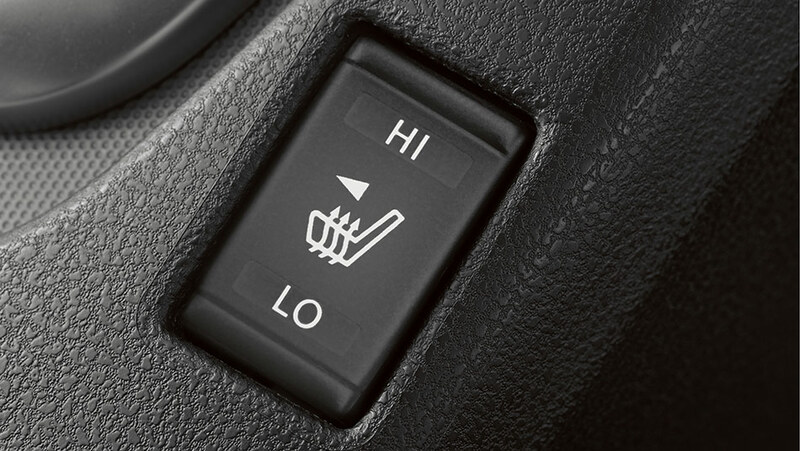 Heated seats are a big plus in winter here in the Midwest. That SL package also provides sportier aluminum alloy 8-spoke wheels, push-button start, two-level heated front seats, fog lights, variable intermittent wipers, Sirius satellite radio a rear seat armrest with cup holders and a Divide-n-Hide rear floor compartment. This allows you to flip up the rear cargo floor to hide a few items under it. That, plus the split fold-down rear seats give the Note a lofty 38.3 cubic feet of cargo space, or 18.8 cubic feet when the rear seats are in place for riders. This is a small car and best for two adults up front and small kids or youngsters in cars seats in back. But you can squeeze four grown-ups in, in a pinch. The Note also has sun visors with extenders, but does not have automatic lights and its radio had a strange glitch. Often when I turned the radio volume knob up, it turned the sound off. I then had to tap the sound button on the steering wheel hub to ratchet the sound back up. Odd! The test car, as you can tell, was not a stripped down model. It also added carpeted floor mats and a cargo mat for $175, plus a rear cargo cover for $90. With all that, plus a $790 delivery charge, the tester hit $19,545. Under the hatch there’s plenty of cargo room. Not to end on a sour note (sorry), but there are many other small car choices at that price that will give you more power and better handling and ride than the Note. 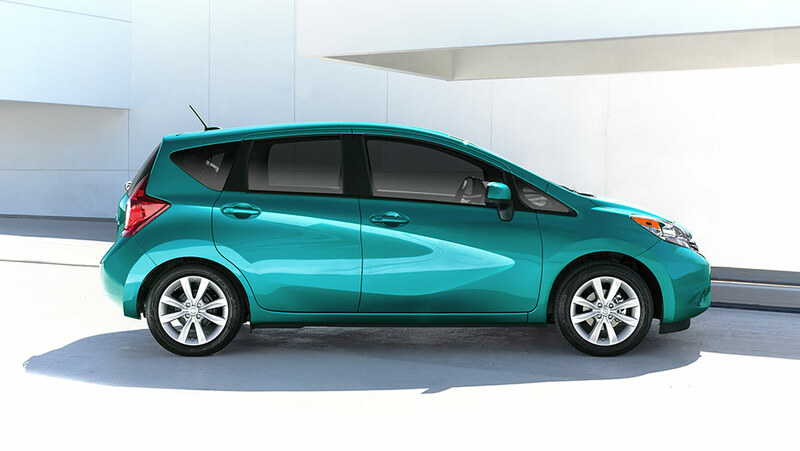 If your budget dictates an ultra-low cost new car though, the Versa sedan or Versa Note hatch will get you where you need to go, economically. Like at the buffet, just lay off all the extras. 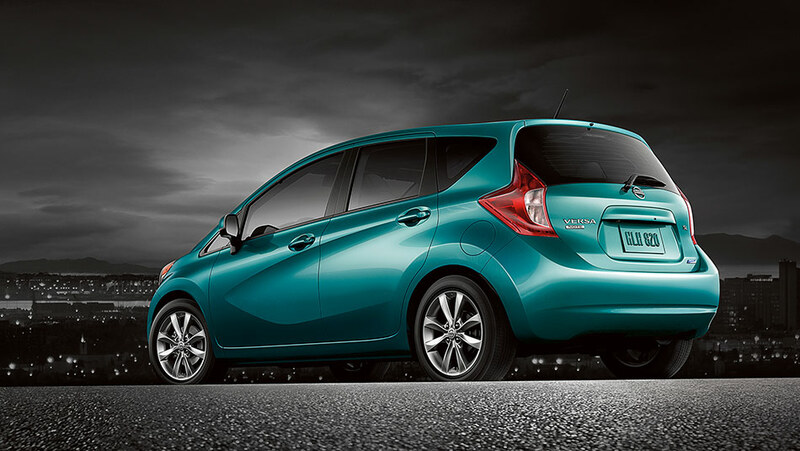 Hits: Good gas mileage, handy hatchback design, front seats have 2-level heat and car has good visibility all around. Like the simple dash and controls, plus this one added a backup camera. Misses: Lackluster power with CVT, plus a rough ride and no automatic lights. Radio volume control knob had a glitch that turned the sound all the way off sometimes as you tried to turn the volume up.